Thousands of years ago, the melting mile-thick glaciers of the Wisconsin Ice Age left the North American continent a magnificent gift: five fantastic freshwater seas collectively known today as the Great Lakes — Lake Superior, Lake Huron, Lake Michigan, Lake Erie and Lake Ontario. From the westernmost tip of Lake Superior at Duluth, Minn., to the easternmost tip of Lake Ontario at Watertown, N.Y., lakes stretch a thousand miles across the heartland of both the U.S. and Canada, creating nearly 9,500 miles of ocean-like shores. The lakes also contain an estimated 35,000 islands.Officially dubbed “the nation’s fourth seacoast,” the U.S. Great Lakes shoreline alone totals more than 4,500 miles — longer than the U.S. East and Gulf coasts combined. As seen from space, the Great Lakes constitute one of the most identifiable features of the North American continent as well as our planet Earth. The North American Great Lakes are unique among the world’s large lakes in that their basins are linked together and form one continuous drainage basin. Together, they constitute the greatest freshwater system on Earth, covering an area larger than Texas and about half the size of Alaska. 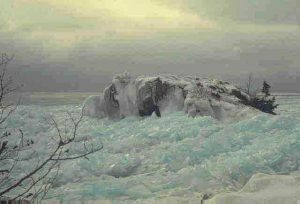 Starting in Lake Superior, the water flows out the lake’s southeastern tip down the St. Marys River into Lakes Michigan and Huron, which actually are two halves of one lake. 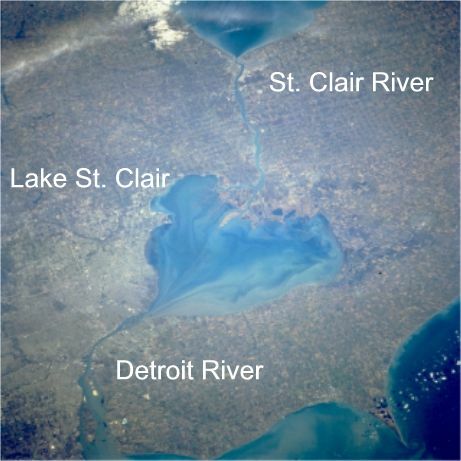 From there, the water flows southward from the southern tip of Lake Huron down the St. Clair River through “little” Lake St. Clair and the Detroit River to Lake Erie. 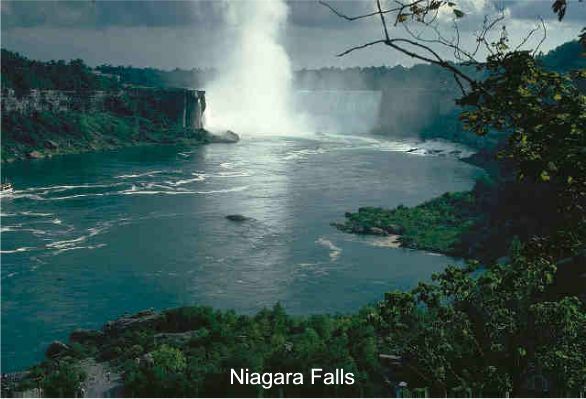 Leaving Lake Erie, it flows north via the Niagara River and over Niagara Falls into Lake Ontario. 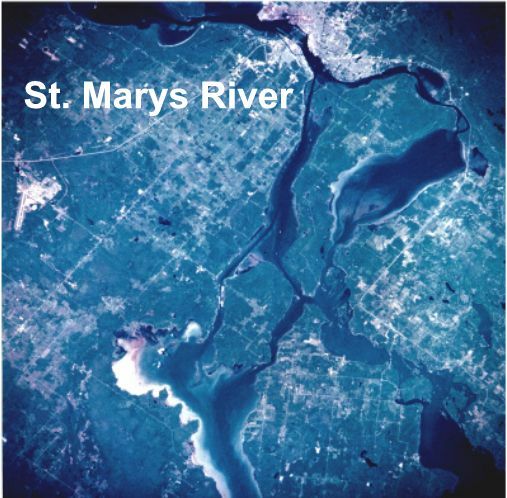 It then flows northeast down the St. Lawrence River — the last link in a 2,000-mile-long waterway that ultimately connects Minnesota to the Atlantic Ocean. However, this stair-step arrangement of basins is relatively new and resulted from the slow rise of the land as it rebounded from the depressing weight of the mile-thick ice sheets. Lake Erie and southern Lake Michigan (Lake Chicago) were first unveiled by glaciers about 10,000 years ago. Both originally drained to the southwest, out the Maumee-Wabash-Ohio and Des Plaines-Illinois rivers, respectively, to the Mississippi River. About 9,000 years ago, the early stage of Lake Superior, called Lake Duluth, drained southwest out the St. Croix and Mississippi rivers, along what is today the Minnesota-Wisconsin border. About 7,000 years ago, as the last ice left, the land to the southwest of Lakes Erie and Michigan had risen high enough that the lakes no longer drained in that direction. 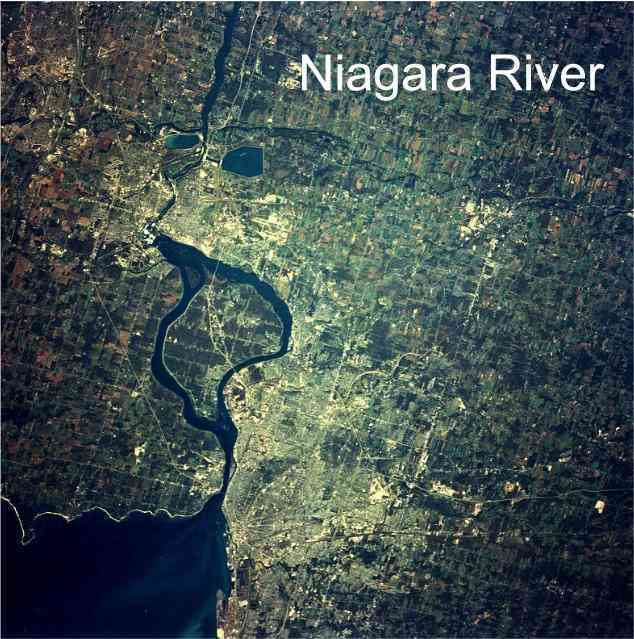 Lake Ontario came into being, and the Niagara River became Lake Erie’s outlet. As the ice sheet retreated into Canada, it temporarily made Lakes Superior, Michigan and Huron into one huge body of water called Lake Nipissing, which had the unusual quality of having three outlets — via the Ottawa-St. Lawrence rivers, Detroit-St. Clair rivers and Illinois-Mississippi rivers. 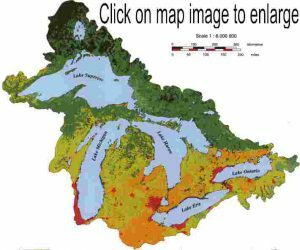 Lake Huron continued to drain eastward out the Ottawa-St. Lawrence rivers until about 5,000-6,000 years ago. Lake Michigan continued to drain out the Illinois River where Chicago now stands until about only 3,000 years ago, when the Great Lakes finally assumed their present shapes. The Great Lakes today hold an estimated six quadrillion gallons of water — a fifth, or 20 percent, of all the drinkable water on the surface of Earth. If all the water in the Great Lakes were spread evenly over the continental U.S., the 48 states would be flooded under more than nine feet of water. The surfaces of the lakes total more than 94,000 square miles — covering an area about the size of the entire state of Oregon. The awesome sizes of the Great Lakes amaze just about everyone seeing them for the first time. These lakes not only look like oceans, they often seem to behave like oceans. They have coastal currents — including dangerous rip currents — and occasional large tide-like changes in coastal water levels called seiches (pronounced “say-shez”) caused by prolonged strong winds and passing storms, as well as storm surges and edge waves. Like the oceans, the lakes also moderate the temperature of the air and increase the amount of rain or snow that falls on the lands surrounding them. Some of the world’s largest grain shipping ports are located on the Great Lakes, and oceangoing ships as well as 1,000-foot lake vessels ply their waters. 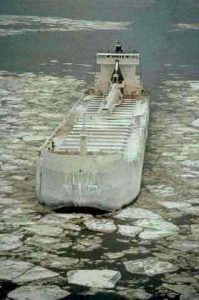 Sailors who have weathered storms on the Great Lakes give these inland seas the same healthy respect they give the other Seven Seas — perhaps an extra measure of respect when the icy “Gales of November” blow early, because the freshwater of the lakes freezes more quickly than ocean saltwater, and a heavy coat of ice can easily capsize and sink a ship. The lakes’ water is usually cold to begin with, because the Great Lakes lie across the 45th Parallel — halfway to the North Pole from the Equator and just 1,200 miles from the Arctic Circle, less than the distance between New York City and Miami. Coupled with the vast forest, agricultural and mineral resources of the area, the abundant supply of water and cheap transportation afforded by the Great Lakes were major factors in the region becoming the population and industrial core of both the U.S. and Canada. About 50 million U.S. and Canadian citizens live and work in the Great Lakes region today, and around half of them depend directly on the lakes for drinking water. The United States’ third largest city, Chicago, is located on the shores of Lake Michigan, and the Great Lakes coastal cities of Milwaukee, Detroit, Cleveland, and Buffalo, N.Y., have populations of more than a million people each. Ontario, the only Canadian province bordering the lakes, contains a third of Canada’s population, while nearly 15 percent of the U.S. population lives in the region. Five of the 10 largest U.S. states by population are Great Lakes states (#3-New York, #5-Illinois, #6-Pennsylvania, #7-Ohio and #8-Michigan). 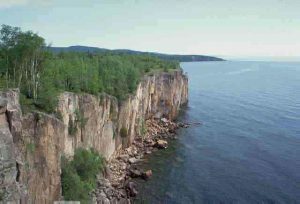 The iron ranges around Lake Superior have been the principal source of ore for North America for more than a century, and the economy of shipping large quantities of ore on the Great Lakes — plus the abundant supply of high quality water for processing it — have made the region a center of iron and steel production. 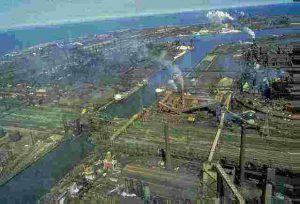 Until recently, the shores and hinterlands of Lakes Ontario, Erie and Michigan held the world’s largest concentration of iron and steel mills. Even today, about half of the steel made in the U.S. and and nearly two-thirds of Canada’s steel is produced in the Great Lakes region. The region’s other major industries include automobile manufacturing, heavy machinery, paper mills, metalworking and shipbuilding. In addition, some 163 million tons of grain, iron ore and other commodities are shipped across the Great Lakes each year, and the sport and commercial fisheries of the Great Lakes currently contribute more than a billion dollars a year to the region’s economy. Along with the Upper Midwest’s multitude of lakes and forests, the Great Lakes help support a substantial regional tourism industry. In fact, a 2011 analysis by the University of Michigan concludes that the Great Lakes generates $62 billion in wages each year and that more than 1.5 million jobs are directly connected to the waterways. Together, the U.S. and Canada share responsibility for protecting and caring for one of the most valuable natural treasures in the world — five magnificent gifts of the glaciers.